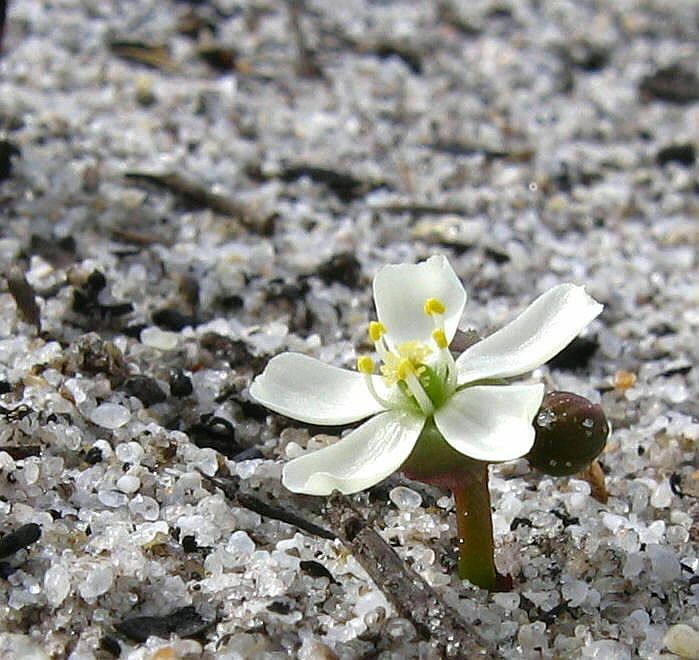 Although an exceptionally common plant, few people have ever seen it flowering in the bush. I have done so on two occasions and then only when associated with a bushfire. 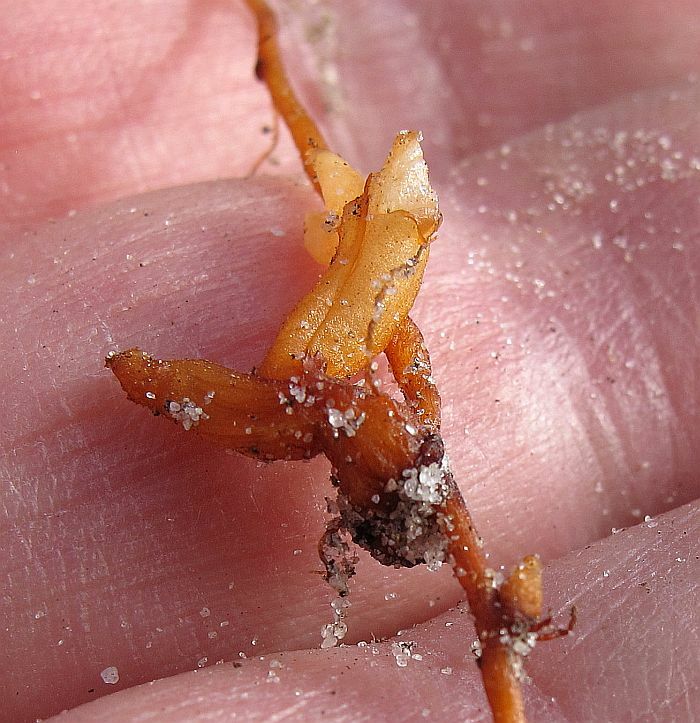 Even when in flower they can be easily overlooked, as the rosettes only appear after the flowers have formed, so the (1 cm or 3/8” dia) white flowers that grow close to the ground and against their usual white sandy habitat can be difficult to spot. 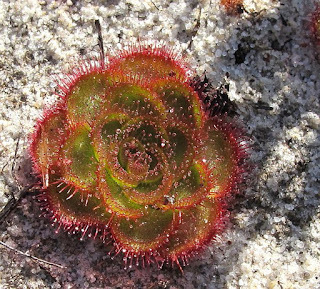 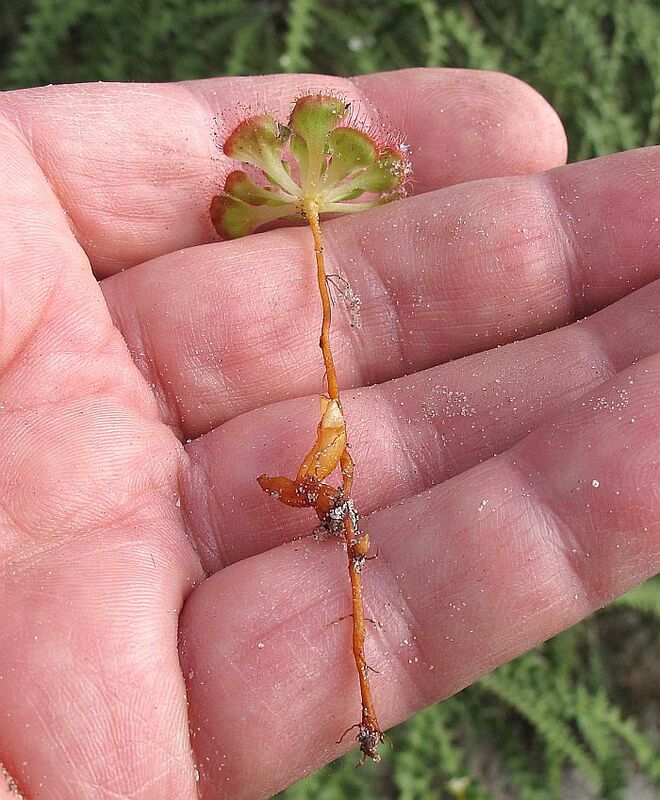 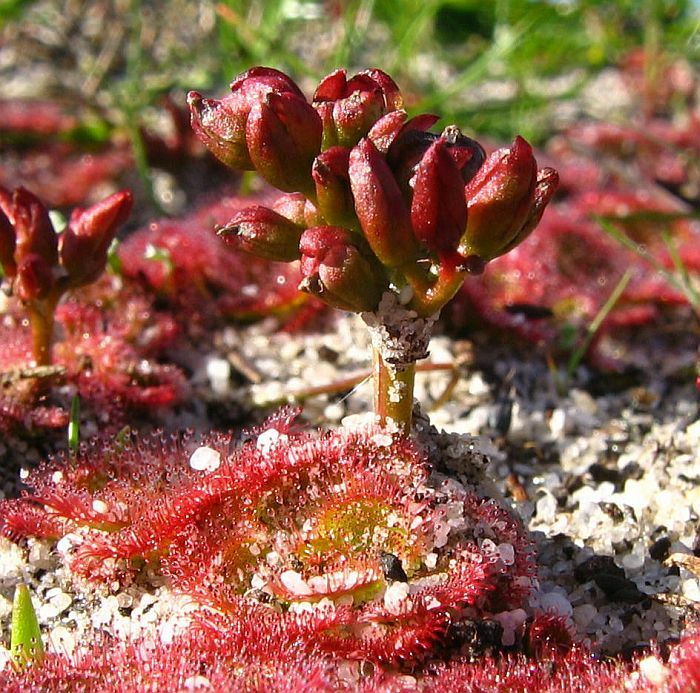 The distribution of Drosera zonaria occurs in a band from Cape Arid to Ravensthorpe, then NW to the Perth region thereby excluding the SW corner of the State. Within its range, it would be difficult to find anyone interested in botany, who has not seen their compact colonies, as their green and red edged leaves form rosettes, commonly growing to over 5 cm (2”) diameter that are not easily missed in their heath or open woodland environments. 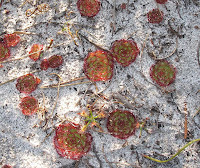 Drosera zonaria has little need to produce flowers, as it mainly reproduces vegetatively, which it does by budding off to form clones of itself from its subterranean stem and above the orange spherical tuber a few centimetres (2”- 3”) below the surface. 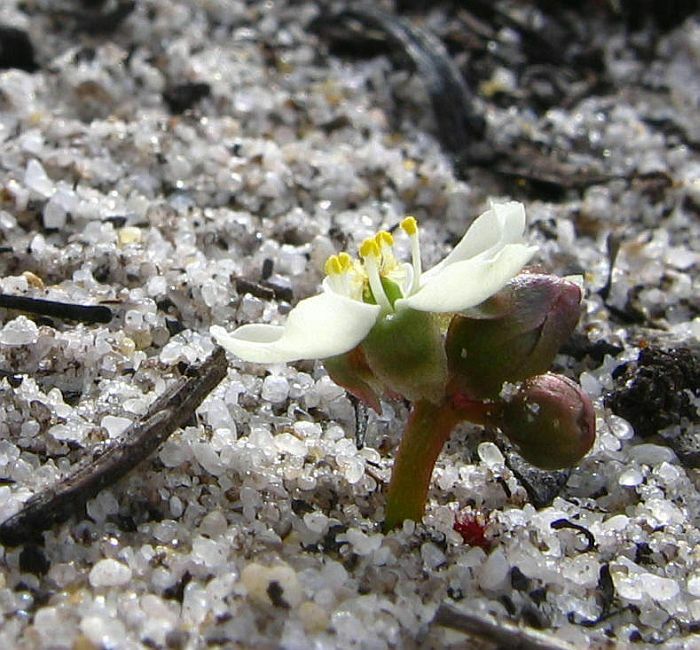 However flowers are required for gene diversity and to establish new colonies, which from my experience they produce after bushfires, when the ground would be cleared of other vegetation and fertilised with their ashes. Seed would probably be spread after passing through the gut of ground feeding animals and birds. 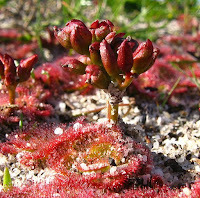 From the flowering plants observed, one colony was where the fire had passed over and the other in an unburnt open space nearby, so the chemicals in smoke may have been sufficient to stimulate floral development. In both cases flowering (recorded from April to June) was in the winter period following a summer fire. The leaves appear during the latter stages of flowering, but will die-off at the approach of warm weather, generally by late spring or early summer. 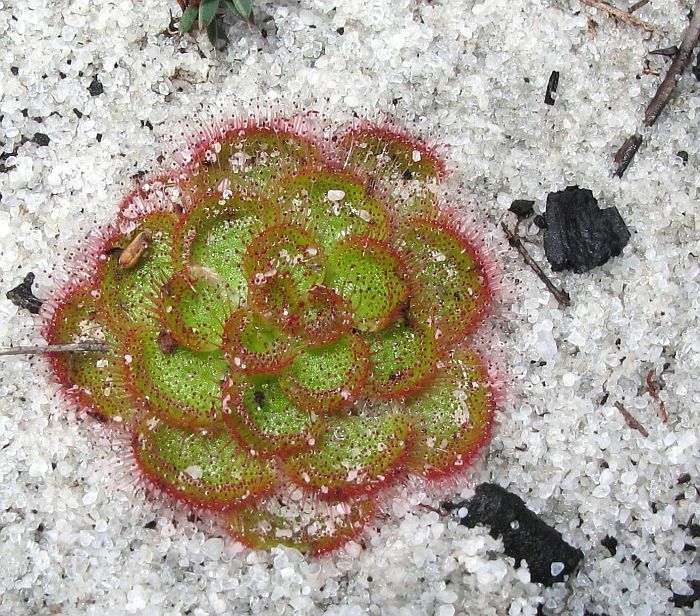 Drosera is part of the Droseraceae (Sundew) family.